Can Google cross the retail chasm with Google TV? Last week, Google announced Google TV, a product that marries the Web with TV. It’s a product category that I’ve been excited about for several years. But creating new product categories is hard. Retail is hard. Doing both together is really hard. 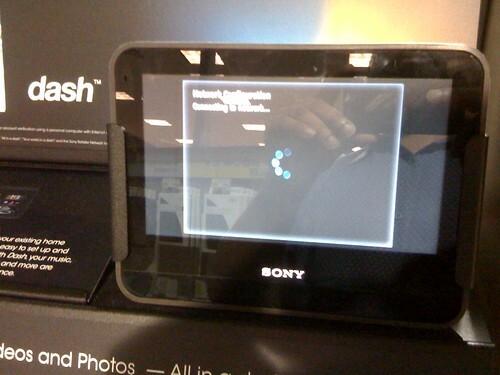 I was reminded of that today at Best Buy, where I saw a display for Sony’s Dash. As best as I can describe it, it’s a cross between an alarm clock, picture frame and MP3 player. Despite Best Buy having a real Dash, I still couldn’t try it out. The unit seemed to be glued to its stand. The screen said it was looking for a network, which it never found. Contrast this experience with the Apple Store in the same mall. There were two tables, each with about a dozen functioning iPads. You could pick up an iPad and play with it for as long as you wanted. There were employees available who knew the device and could answer questions. The biggest challenge? They were sold out of all but the 16GB WiFi iPad. As I wrote before the first iPhone was released, Apple’s retail stores give it a huge leg up when it comes to introducing new product categories. The excitement that they create for product launches (read: free media), combined with the opportunity to experience new products is unmatched in retail. If Apple decides to make Apple TV more than a hobby, its store employees will play a big part in shaping user perception. A big unknown is the price of Google TV. People might pay an extra $50 on a $800 TV for the Google brand, even if they’re not quite sure what it does. It’s unlikely that the price premium will be that small, given the cost of just the Intel Atom processors. I’d expect Google TV to add at least $100 to the price. The other big challenge is that a lot of people have recently replaced their TVs as a result of the digital TV transition. 65% of homes already have at least one HDTV, according to the Consumer Electronics Association. A standalone box is going to to be an even harder sell to all but the geeks. The market is littered with unsuccessful standalone boxes from hard drive and networking gear manufacturers. They’ve all suffered from poor retail support and complexity of set up. For Google to succeed, it will have to spend a lot more money on buyer education than it traditionally has. This entry was posted in apple, apple tv, google, television. Bookmark the permalink. 7 Responses to Can Google cross the retail chasm with Google TV?